Drilling fluid enter into the hollow shaft in the spiral conveyor by the feeding tubes, then flow into bowl. 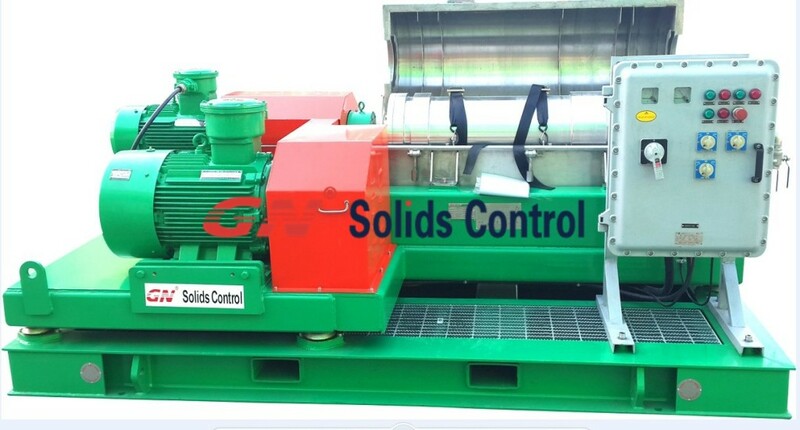 Because of the high speed rotating of the bowl , to drive the entered drilling fluid rotating together, the solid debris in the drilling fluid is thrown the wall of the bowl, the drilling fluid expel from the screw conveyor pushing to the discharge hole of the small port. The choice of centrifuge by the debris size of separation solid phase, the bowl diameter of centrifuge, the highest speed and the separation factors influence, the drilling site commonly used the solid and liquid density difference, as the separation basic of the settlement centrifuge, mainly clear the solid phase substance in the drilling fluid, is the last level of drilling fluid solid control equipment. The rotating body do not have any object to block or interfere the spinning operation. The strength of the belt for main and support motor are not loosen and no crack. Hand turn the body to ensure the rotation is smooth without resistance. If resistance was felt during the rolling by hand, check both main and support motor first. Check the inlet flow tube is open, and flow divider also need to be open when operation is start. Check the water, is it in the rotating body? It needs to check the motor oil level in the gearbox, rotating joints and the usual step list above if decanter centrifuge is not operation for set period of time. The filtering steps that involve with shale shaker and hydrocyclone on desander and desilter can’t remove the most part of debris. Adding centrifuge can process fluid further by remove much smaller debris to achieve much cleaner drilling fluid for zero-discharge drilling fluid systems.